You can sign a PDF document from your phone, tablet, or any other computer and email it off to someone. But some organizations still don’t accept documents via email — you may need to fax documents instead. No, you can’t use your smartphone’s phone connection as a fax machine or dial-up modem. You’ll need to rely on an app or third-party service that does the faxing for you, just as you would sending the occasional fax from your PC. You won’t find an app that lets you send an unlimited number of faxes for free. Every app you’ll find here will cost you money to use regularly. Some apps may let you send a handful of pages for free, but that’s it. These services have to maintain phone numbers and interface with the telephone network for you. Your smartphone can’t act as a dial-up modem, so you’re depending on a service’s servers to do the heavy lifting. But, although this will cost you, it can save you money and be more convenient than the alternative. The alternative is paying to use fax machines at a store, or purchasing your own fax machine and hooking it up to a telephone landline. Both will likely be significantly more expensive if you just need to send a few faxes. This method also lets you do everything entirely electronically. 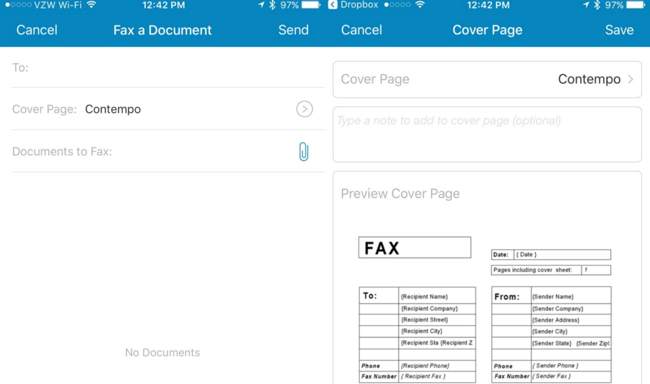 You can sign and fill in PDF documents on your phone and fax them. Or, use your phone’s camera to scan paper documents and fax them. Search for “fax” on the App Store and you’ll find quite a few options, but none of the apps are actually free, and the few that do provide a few free fax pages are usually limited to just a handful of pages before they start charging you. But there’s a bigger problem — the vast majority of the time when you need to fax something, you’re faxing a document that contains very personal information — it’s health care and government that tend to require faxing things, after all, and they are also dealing with your personal information. You should not trust just anybody with handling your personal information in a fax. So we’ve got some recommendations for you. If you are going to be sending sensitive faxes all the time, or you work for a company and you’re trying to choose a service, RingCentral Fax, which is partially owned by Cisco and AT&T, is probably the best choice for your needs, especially since they have a lot of great security features and support for multiple users with separate fax lines. They also have a really slick mobile app that’s probably one of the nicest ways to deal with faxing, or you can send faxes through email instead. It has all the other features you can imagine, including integrations with Outlook, Google Drive, Dropbox, Box, and you can even get a toll-free number. It also has a lot of security features that would be useful for businesses or people that are transmitting secure information. Of course, if you just want to send a few faxes, you can sign up for one of their cheap plans that start under $7 per month… and then just cancel after a month or two. If you just want to send a few faxes every now and then, you can also choose eFax, which is well known as the company that basically invented faxing digitally. They have a nice mobile app that lets you both send and receive faxes. If you just need to send the occasional fax, we also recommend MyFax, which lets you send up to 10 free pages without having to pay. This doesn’t sound like much, but it’s more pages per month than most people have to fax per year. If you do need to send more pages each month, you can upgrade to a regular plan. Both of these providers are reputable and owned by the same large company that has been doing this for years. It’s not some fly-by-night operation. They might not have all the security features that RingCentral does, but you don’t need to worry about who has your personal information. If you’re using Windows Phone, Blackberry, a Fire Tablet, or some other operating system, you can always sign up for RingCentral, eFax, or MyFax and then use their website to send the fax — or you can use their fax by email feature. Almost all of the providers let you send faxes by emailing a document to the number you are trying to fax to, combined with a custom ending. For instance if you wanted to fax something to 800-555-1212, you would send the document to an email like [email protected] (not a real address). Being able to send faxes over email means that any mobile device can easily send faxes without needing to install an extra app. Ultimately, there’s no single best fax application for everyone. If you need to send quite a few pages on an ongoing basis, a subscription-based service like RingCentral or eFaxcould be the best. If you want to just send a quick fax, MyFax is probably your best bet. If you’re using another smartphone platform (like Windows Phone), your best bet is to find a fax service that lets you fax by email, which is generally the easiest and best way to send faxes anyway.